Recently, my boss gave me a task, I need to organize the company's activities images and convert them to PDF file. And it's a real problem for me. Because I'm not familiar with PDF. I think it's a lot of trouble to convert an image to PDF file, not to mention a pile of images. How can I finish this task? 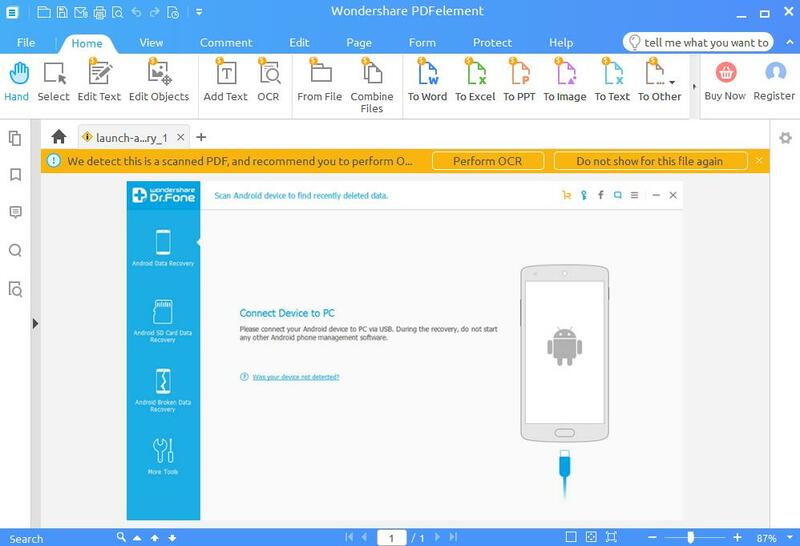 In our work, converting the file format is a very common task, such as converting PPT to word or other. The convert image to PDF file is relatively rare. However, we should grasp the method. And if we want to convert the file smoothly and quickly, we need PDFelement's help. 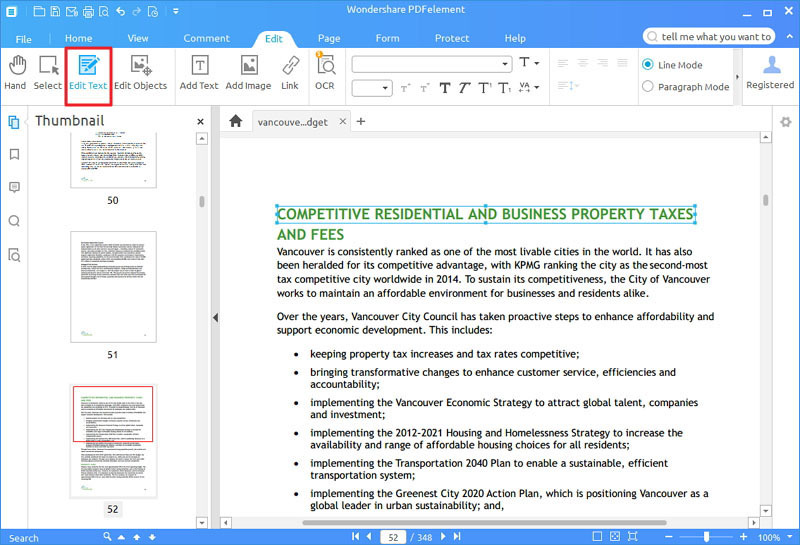 PDFelement is an all-in-one PDF converting and editing tool. You can use it to convert a variety of documents to the PDF file, such as converting images, word, PPT to PDF files. Of course, you can also use it to convert PDF files to images, word and other formats. It will provide you with a complete set of tools to solve a variety of problems on the PDF file. For example, it can edit PDF files, including adjust text size, font, style, etc.. It can also help you merge multiple files. What's more, it can create several PDFs from different file formats. Well, let me show you how to use PDFelement to convert your images including JPG, PNG, GIF, TIFF and more to PDF. 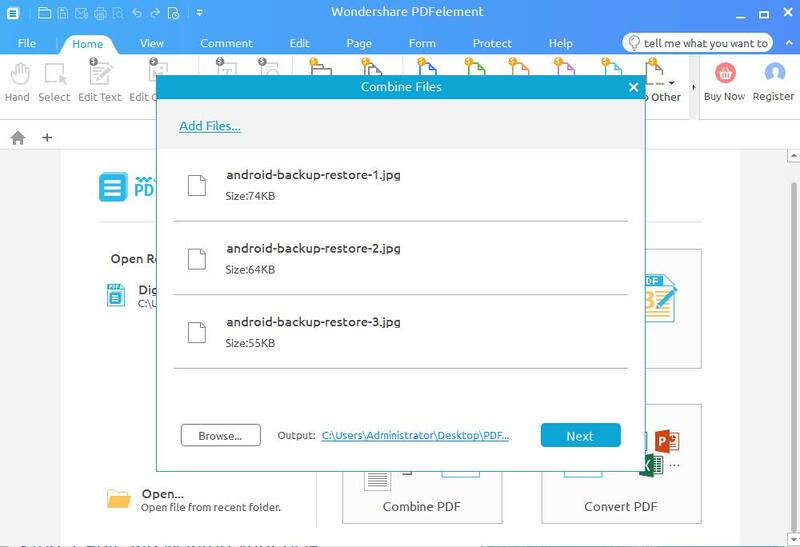 Download PDFelement to your computer, and then install it according to the prompts. Next, run it and you will get the following interface. When you run PDFelement, from the menu bar and click "Home". Then click the "From File" button. 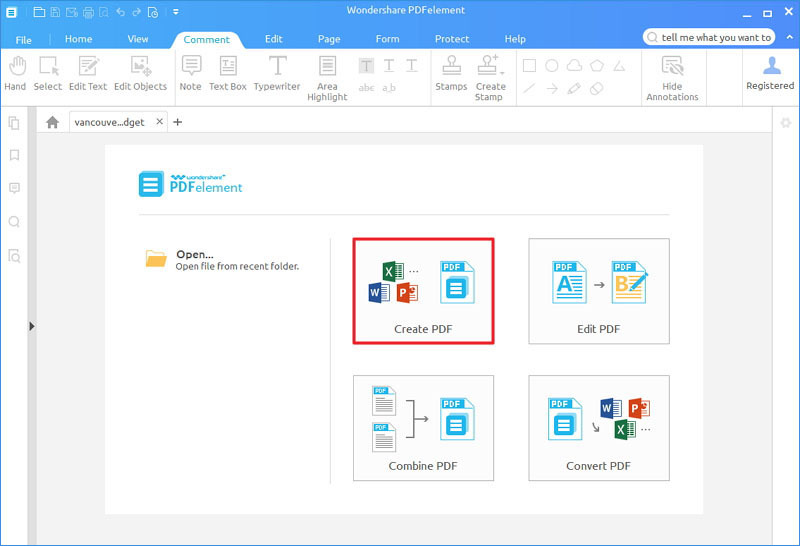 Or you can directly click the "Create PDF" button on the Home window. Then, the program will pop up a window, you need to select the image to convert. Next, open the image, the image will be displayed as PDF file, click Save button in the upper left corner to save it to your computer. If you need to convert a batch of images to a PDF file, please continue read on. Please click "Combine PDF" on the "Home" window or "Combine Files" button under the Home menu. The program will pop up a window, click "Add Files" to add images you need to convert and click "Next". Then, all images will be merged in a PDF file. 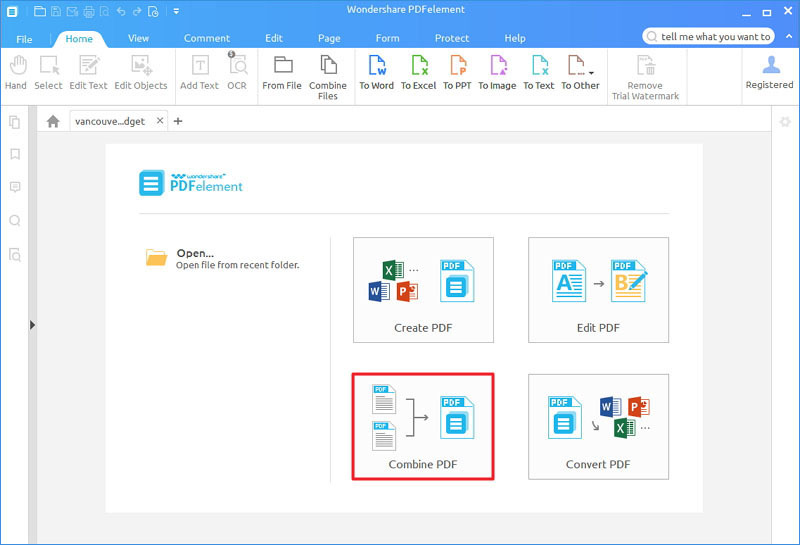 My suggestion is that you can save all the images you need to convert to a folder, and then you can select them, all of the images will be converted to a new PDF file. If you have a need to edit your PDF files, you can go to the "Edit" tab and choose an option as you like. Here you can insert, delete texts and images, rotate and resize images. Under the "Page" menu, you can get the options to add new PDF pages, delete and replace pages from PDF, rotate and crop pages etc. If you want to add sticky note, text comment to your PDF, or highlight, underline your PDF, you can navigate to the "Comment" tab and choose an option.